Call to the Bullpen gets you set for this year’s winter meetings with division by division previews; team needs, potential targets and predictions. T’is the season of unsubstantiated trade rumors and shocking blockbuster deals! With three of baseball’s four best records in 2015 residing in the National League Central, it’s interesting to look at how those teams stack up entering 2016 and just how much they need to repeat their success. And will they be threatened by any dark horses next year? Somehow, with nagging injuries to Matt Holliday, Adam Wainwright and Matt Adams, along with losing the overrated-but-still-valuable Yadier Molina toward the end of the season, Mike Matheny’s Cardinals managed to win 100 games to cement the best record in all of baseball. This wasn’t enough to beat their surging rivals in Chicago during the Division Series, but they persevered through unlikely odds to finish the season strong. It’s a testament to the philosophy of the Cardinals organization – the “next man up” idea we had pounded into our brains this past summer – that allowed replacements like Randal Grichuk, Stephen Piscotty and Tommy Pham to answer the call when guys went down and succeed with flying colors. There’s a system in St. Louis that players buy into from the ground up, and there’s no reason to think any holes can’t be filled from within, as they have done so frequently for the last decade and a half. Still, losing Jason Heyward and John Lackey are huge due to what they gave the Cardinals in 2015. Lackey had a career year at 36-years-old, but may very well sign elsewhere. With young starters like Tim Cooney, Marco Gonzales and Tyler Lyons along with a healthy Wainwright, the Cards may not have to look very far for replacements. Heyward slashed .293/.359/.435 with 13 home runs, and while his power numbers were underwhelming, he was a consistent presence in the lineup and especially right field. There’s no indicator the Cardinals plan to give Heyward a big contract, which means they’ll need a new presence in his stead. St. Louis has no shortage of outfielders, with Grichuk, Piscotty, Pham and Jon Jay all reasonable options between center and right. The Cardinals have needs, and they have the pieces to fill them from within. They might try out the free agent market for an additional starter to replace Lackey/stand by for injury, but I’d be hard-pressed to see them signing a second-tier starter like Scott Kazmir or Mike Leake. More than likely, a Mark Buehrle or Jeremy Guthrie type could suit their interests; cheap, experienced with upside harnessed somewhere within them despite their age. One of baseball’s most pleasant surprises since 2013 has the tools in place to succeed for many years to come. Andrew McCutchen is one of the game’s elite players (and most marketable guys), and they’ve got him along with Sterling Marte locked up for six more years. Add Josh Harrison and Jung Ho Kang for four years and club-controlled studs like Gerrit Cole and Gregory Polanco, and you’ve got one heck of a core in the Steel City for some time. This doesn’t make Pittsburgh’s operation perfect. They just non-tendered Pedro Alvarez, making him a free agent and removing a big, albeit inconsistent, power bat. J.A. Happ was a terrific story for them after being traded which led to him being grossly overpaid by the Toronto Blue Jays. Despite Pittsburgh’s core, they’ve always found success with spare parts like Happ and Edinson Volquez, and this led each to bigger opportunities in bigger markets. And they still have an excellent Francisco Liriano in the rotation. Ray Searage gets a lot of well-deserved credit for these reclamation projects, and there’s no reason to think he can’t fix another guy. Question becomes, who? Tim Lincecum and Doug Fister are two guys who have suffered from injury and loss of velocity, respectively, hampering their former dominance. When these two peaked they put together unbelievable careers, and they’re still relatively young. Lincecum’s hip remains an issue, but one has to wonder, if the Pirates can get either of these guys for cheap, if they can reclaim some semblance of their former glories? Neil Walker has also been on the block, and rumors have circulated about possibly trading with the Mets. They won’t get Harvey or deGrom, but they do have a surplus of starters in Queens they can part with. They also lost utility man Sean Rodriguez, whose famous last moments in a Pirates uniform were spent obliterating a Gatorade cooler after an errant Jake Arrieta pitch in the NL Wild Card game. His versatility was valuable, and one has to wonder if Ben Zobrist could be a good fit at PNC Park. His age is somewhat of a concern, but he’s been a solid offensive force and consistent defensive presence everywhere he’s gone. He would be an upgrade to Rodriguez, and with the possible departure of Walker, he could be the everyday second baseman. Like St. Louis, there aren’t many holes to fill in Pittsburgh, and the team’s ability to find talent without spending an incredible amount of money has been impressive. I don’t expect any blockbusters because the Pirates are basically there, they just need the pieces to get over the hump, and those many not be hard to find. The 2015 miracle team that took home the NL Cy Young (Arrieta), Manager of the Year (Maddon), and Rookie of the Year (Bryant) enters next season high off one of the best years in franchise history but an ultimately depressing NLCS sweep to the New York Mets. As good as the Cubs were in 2015, there’s work to be done. The Cubs entered the offseason in dire need for a third starter, and they filled that hole yesterday with the signing of John Lackey. Now the Cubs are in a dire need to sign an additional outfielder with the likely departure of Dexter Fowler. Word is Javier Baez will be tested in center field during winter ball; his adjustment on several infield positions since 2014 went seamlessly, but his ability to transition his defensive skills to center field remain unknown. Even if Baez becomes a quality outfielder, the Cubs still need something else in the outfield. Chris Coghlan and Jorge Soler return, but Coghlan can’t hit left-handed pitching, and the jury is still out on what the team will do with Kyle Schwarber. Several days ago I had it written that the Cubs should open the books and spend wildly for Jason Heyward; he’s the perfect addition to the lineup, but signing Lackey makes this seem more unlikely. Theo has surprised people before. The Cubs still have a second wave of prospects making their way through the system, and many outfield trade targets exist to help improve the outfield. One of the more attractive suggestions is Rockies center fielder Charlie Blackmon, whose speed and above average ability to get on base would fit nicely in the Cubs lineup. 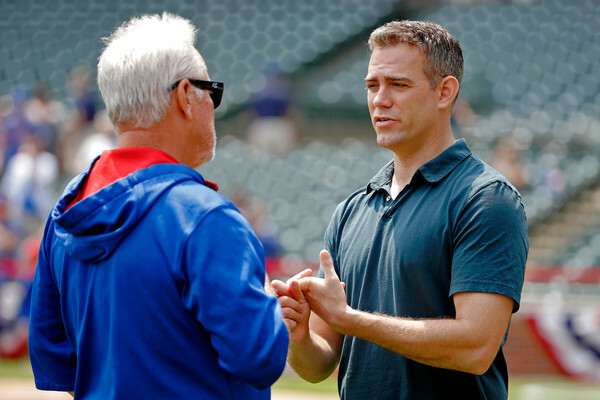 Theo Epstein and Jed Hoyer proved in 2015 their scouting and development acumen paid off after several miserable seasons since their arrival. There’s no reason to think they won’t fill the holes on the Cubs with equal precision. The Brewers were the latest to sign a young gun as their general manager in David Stearns, a highly acclaimed executive who was unnecessarily questioned – frequently – about his age and experience, totally overlooking the success of guys like Theo Epstein and Jon Daniels at very young ages themselves. Since Stearns took the reins, there appears to be an organizational focus in trading away bloated contracts and rebuilding the Brewers in order to compete with divisional rivals that have successfully done the same. Problem is, as previously mentioned, the Cardinals, Pirates, and Cubs are all in positions for long-term success, so this could take quite some time in Milwaukee. It may not be tricky, however, if Stearns and Co. are smart in how they do it. There’s a lot of value right now for players like Adam Lind, Matt Garza and especially Jonathan Lucroy. If the Brewers front office holds out for best offers, but also pounces on opportunities when they’re presented and show a willingness to eat some money (as would have to be done with Garza), they could bring in some really good prospects to fill out their roster. This leaves them with the albatross contract of Ryan Braun, who had a solid 2015 but is also owed roughly $20 million a year for the next five seasons. Good as he can be, it’s wildly unlikely the Brewers can move him right now. We can chalk up 2016 as a rebuilding year in Milwaukee, unless they really come out and surprise people and that seems unlikely. The best thing fans can do is sit back and wait; they see the success of rebuilding efforts whenever the Pirates and Cubs come to town, and those didn’t happen overnight. It’s always fun when a team embarks on a rebuilding project and the Brewers are no different. Joey Votto, Homer Bailey, Jay Bruce and Brandon Phillips are owed so much money over the next several years, and at least one of them (Bailey) has never, ever been worth his. Phillips is older now, and Bruce is always an attractive trade piece the Reds just never move. That’s not to say there isn’t upside! Raisel Iglesias and Anthony DeSclafani were solid additions to the rotation in 2015 and give the Reds some hope in the team’s youth movement. The Reds are in a weird sort of baseball purgatory: they recognize the need for young talent and even have some of it, but are still latching on to “fan favorites” of moderately successful times that are now faded memories. I’m not saying they should trade Votto; he’s a franchise player. (Think of the return, though!) Everyone else? Bruce, Phillips and Aroldis Chapman should be fair game; let those guys succeed in other markets, haul in some future pieces and start to rebuild. Even hometown hero Todd Frazier could bring in a huge return after last season, and every team needs a good third baseman. Trading Johnny Cueto was a good start, but they need to go further. Cincinnati needs, and deserves, a fresh start. The ol’ stalwarts filling out the lineup represent a period of underwhelming, moderate success when they should have achieved an awful lot more while these guys peaked. The Cueto trade may be evidence that they know this, but we haven’t seen anything else to indicate such awareness. This will be an interesting one to watch.